An anti-icing coating is a type of hydrophilic coating that is applied on surfaces exposed to cold environments to prevent the buildup of ice or snow. Ice buildup is a common issue in several countries. Aircraft, power utilities, telecommunication lines, wind mills, solar panels, electric equipment, and utilities such as heat exchangers in chemical plants experience damage due to icing. Icing or accumulation of ice caused by freezing of liquid on a surface hampers the functioning of systems. For example, icing on screens and the body of an aircraft damages its aerodynamic shape to a large extent and increases the load on the aircraft. Anti-icing coatings is an efficient method to cut costs and address safety concerns associated with icing. This is estimated to be a key driver of the anti-icing coatings market during the forecast period. Based on substrate, the global anti-icing coatings market has been segmented into metal, glass, concrete, and others. The metal segment is estimated to dominate the market during the forecast period. The segment is estimated to expand at a rapid pace during the forecast period. Anti-icing coatings provide a layer of protection from the environment and reduce deposition of ice on the metal surface. The glass segment is estimated to expand at a faster pace during the forecast period in terms of CAGR. Snow or ice accumulates on glass windows and windscreens of automobiles and aircraft. Icing on windward surface of an aircraft changes its aerodynamic shape and poses a safety hazard. Hence, the glass segment is anticipated to expand at a considerable pace during the forecast period. In terms of application, the global anti-icing coatings market can be classified into aerospace & automotive, renewable energy, power utility & telecommunication, construction, and others. The aerospace & automotive segment accounted for a leading share of the global market in 2017. The segment is estimated to expand at a rapid pace during the forecast period. The renewable energy segment held a large share of the market in 2017. This segment is also estimated to expand at a rapid pace during the forecast period, due to rise in the use of anti-icing coatings on rotor blades of wind turbines. Anti-icing coatings are widely used on rotor blades of wind turbines. Icing causes safety hazards to rotor blades and leads to forced stoppages of wind power plants. These power downtimes are not financially feasible. Moreover, icing affects the life and mechanical strength of rotor blades. Removing ice mechanically from rotor blades is not feasible. Thus, anti-icing coatings offer a more convenient alternative for conventionally used methods such as manual removal and use of chemicals and heating coils. Based on region, the global anti-icing coatings market can be classified into North America, Europe, Asia Pacific, Middle East & Africa, and Latin America. 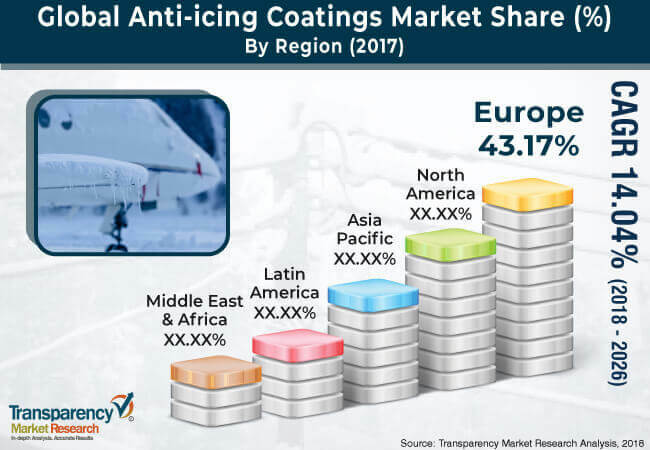 Europe was the leading market for anti-icing coatings, in terms of both value and volume, in 2017. The region is estimated to continue its dominance during the forecast period. The region consists of Nordic countries, which have cold climate and which are prone to issues caused by ice accumulation. The market in the region is estimated to expand at a significant pace during the forecast period. North America is a leading consumer of anti-icing coatings across the world. The market in the region is likely to expand at a rapid pace in the next few years. This can be attributed to cold climatic conditions in the region, which augment the demand for anti-icing coatings. Asia Pacific holds a significant share of the global market for anti-icing coatings. The market in Latin America and Middle East & Africa is anticipated to expand at a considerable pace during the forecast period. The two regions are likely to create lucrative opportunities for the anti-icing coatings market from 2018 to 2026. The global anti-icing coatings market is dominated by large-sized players. Presence of a large number of small- and medium-sized players makes the market highly competitive. Key players operating in the market are PPG Industries Inc., DowDuPont, 3M Company, NanoSonic Inc., Aerospace and Advanced Composites GmbH, NEI Corporation, Cytonix, and NeverWet LLC. High growth potential of the market is attracting new local as well as international players toward the market. Anti-icing coatings are hydrophilic coatings that are applied on surfaces exposed to cold environments to prevent the buildup of ice or snow. Ice buildup is a common issue in several countries. Aircraft, power utility, telecommunication lines, wind mills, solar panels, electric equipment, and utilities such as heat exchangers in chemical plants experience damage caused by icing. Icing or accumulation of ice caused by freezing of liquid on a surface hampers the functioning of systems. For example, icing on screens and the body of aircraft damages its aerodynamic shape to a large extent and increases the load on the aircraft. Anti-icing coatings is an efficient method to cut costs and address safety concerns associated with icing. This is estimated to be a key driver of the anti-icing coatings market during the forecast period. Based on substrate, the global anti-icing coatings market has been segmented into metal, glass, concrete, and others. The metal segment is estimated to lead the market between 2018 and 2026. The segment is estimated to expand at a rapid pace during the forecast period. Anti-icing coatings provide a layer of protection from the environment and reduce deposition of ice on the metal surface. The glass segment is estimated to lead the market during the forecast period. In terms of application, the global anti-icing coatings market can be divided into aerospace & automotive, renewable energy, power utility & telecommunication, construction, and others. The aerospace & automotive segment accounted for a leading share of the global anti-icing coatings market in 2017. The segment is estimated to expand at a rapid pace during the forecast period. The renewable energy segment held a large share of the market in 2017. This segment is also estimated to expand at a rapid pace during the forecast period, due to rise in the use of anti-icing coatings on rotor blades of wind turbines. Based on region, the global anti-icing coatings market can be classified into North America, Europe, Asia Pacific, Middle East & Africa, and Latin America. Europe was the leading market for anti-icing coatings, in terms of both value and volume, in 2017. The region is estimated to continue its dominance throughout the forecast period. North America is a leading consumer of anti-icing coatings across the world. The market in the region is likely to expand at a rapid pace in the next few years. This can be attributed to cold climatic conditions in the region, which augment the demand for anti-icing coatings. Europe is a major consumer of anti-icing coatings. The region consists of Nordic countries, which have cold climate and which are prone to issues caused by ice accumulation. The market in the region is estimated to expand at a significant pace during the forecast period. Asia Pacific holds a significant share of the global market for anti-icing coatings. The market in Latin America and Middle East & Africa is anticipated to expand at a considerable pace during the forecast period. The two regions are likely to create lucrative opportunities for the anti-icing coatings market from 2018 to 2026. The report analyzes and forecasts the anti-icing coatings market at the global and regional levels. The market has been projected in terms of volume (tons) and revenue (US$ Mn) from 2018 to 2026. The study includes drivers and restraints of the global anti-icing coatings market. It also covers the expected impact of these drivers and restraints on the demand for anti-icing coatings during the forecast period. The report also highlights growth opportunities for the anti-icing coatings market at the global and regional levels. The report comprises a detailed value chain analysis, which provides a comprehensive view of the global anti-icing coatings market. Porter’s five forces model for the anti-icing coatings market has also been included to help understand the competition landscape of the market. The study encompasses market attractiveness analysis, wherein substrate and application segments have been benchmarked based on their market size, growth rate, and general attractiveness. The study provides a decisive view of the global anti-icing coatings market by segmenting it in terms of substrate, application, and region. These segments have been analyzed based on the present and future trends. Regional segmentation includes the current and future demand for anti-icing coatings in North America, Europe, Asia Pacific, Latin America, and Middle East & Africa. The report also covers individual substrate and application segments of the market in all regions. The study includes profiles of major companies operating in the global anti-icing coatings market. The global market for anti-icing coatings is dominated by large-sized players. Key players operating in the market are PPG Industries Inc., DowDuPont, 3M Company, NanoSonic Inc., Aerospace and Advanced Composites GmbH, NEI Corporation, Cytonix, and NeverWet LLC. Market players have been profiled in terms of company overview, business strategies, and recent developments. The report provides the market size (in terms of value and volume) of the global anti-icing coatings market for the base year 2017 and forecast for the period 2018–2026. Market numbers have been estimated based on substrate, application, and regional segments of the market. The market size and forecast for each substrate and application segment has been provided for the global and regional markets.